It’s a grimdark mash-up when Games Workshop’s iconic Warhammer 40,000meets WizKids’ Dice Building Game in Warhammer 40,000 Dice Masters, which streets next July. The initial wave will include the Battle for Ultramar Campaign Box, the Orks – WAAAGH! Team Pack, and the Space Wolves – Sons of Russ Team Pack. Set in the dark sci-fantasy world of Warhammer 40,000, the game allows players to build teams of iconic characters and warriors to battle it out for supremacy using custom dice and cards. Warhammer 40,000 Dice Masters uses the game system designed by Mike Elliott and Eric M. Lang for Dice Masters, and will be completely compatible with other games in the line. There will be four factions available at the start, and players can build teams using a single faction, or mix and match to create their own Dice Masters team. The initial release of Warhammer 40,000Dice Masters will be centered around the Battle for Ultramar Campaign Box. This starter box will be a fixed content set that includes everything needed for two players to play the game: a force of Ultramarines, a force of Deathguard, Sidekick dice, Basic Action dice, and dice bags for both players. More than 12 characters appear in the set, including the Ultramarines Primarch Roboute Guilliman and Chief Librarian Tigurius, as well as the Deathguard heroes Typhus and Mortarion. MSRP is $39.99. Players can expand their games with two separate Team Packs, each introducing another faction to the game. The Orks – WAAAGH! 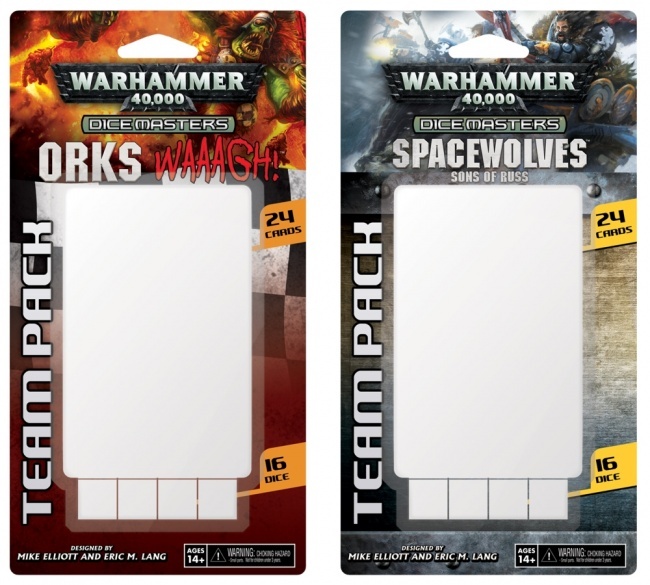 Team Packoffers the uncontrollable Orks, with the infamous Ork warlord Ghazghkull Thraka and the Boyz and Warbikers under his command.The Space Wolves – Sons of RussTeam Pack, meanwhile, introduces Logan Grimnar and the Venerable Dreadnought at the front of a Space Wolves Space Marine force. The two Team Packs each include 24 cards and 16 dice. They are intended for use with the Battle for Ultramar Campaign Box. MSRP is $12.99 each. More news as we get it! We will no doubt be trying this out when it arrives!